Our summer together has come to an end, but it was absolutely a blast while it lasted! We enjoyed a week of FFA Leadership Camp, AOI, HYMAX and HYPE. It could not have been more fun! August was a month to remember for sure. I know that so many of you worked tirelessly with your fair exhibits all summer long to get them looking their best for the one, the only, the best time there is —THE MISSOURI STATE FAIR. Whether this preparation was catering to livestock, fertilizing your garden treats, restoring a prize tractor, or perfecting your ag mechanic projects, I know first-hand the time and effort that it took to get your projects to fair quality. So congratulations, fairgoers and friends! At the fair, you might have heard of a super cool event that took place on Tuesday, the 15th — Food Insecurity Service Day. Approximately 400 of our absolutely awesome FFA members gathered together at the state fair to pack 50,000 meals for hungry tummies across rural Missouri. Way to embody the “living to serve” portion of the FFA motto, my friends! If you didn’t make it to the fair this year, I hope next year’s fair is calling your name. 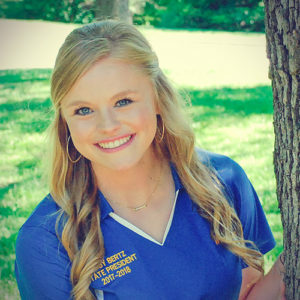 This year’s Missouri State Fair brought FFA members countless opportunities and memories, and this school year will, too! This is a new school year full of exciting, unique things. Take advantage of each one. Trust me, you will not regret it. Whew, another great school year has come and gone—in a hurry I might add! With the 89th Missouri State FFA Convention, spring contests and our final 2016-2017 classes behind us, we can start getting excited and thinking about all the summer FFA activities awaiting us! 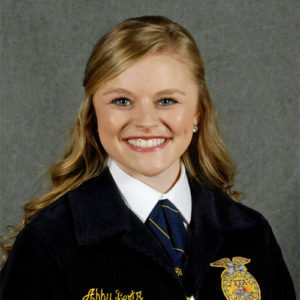 While you may not be in the agriculture classroom everyday this summer, FFA can still be at the forefront and bring just as much excitement as it did throughout the school year. As an incoming freshman, I remember being SO excited for my first real FFA activity—FFA Camp. I will never forget the camaraderie formed on the bus all the way to Camp Rising Sun. My chapter sang our hearts out the whole time and a few of us might have lost our voices by the time the two and half hour drive came to an end. Whether you’re attending your first FFA Camp or your last, I hope you not only meet many of new people and are inspired and motivated for another year in FFA, but also you cherish those fresh donuts in the dining hall too—my personal favorite. Whatever you do this summer, whether it be working with your SAE, attending HYPE, MAbA, camp, or the various other FFA conferences and academies, I hope you do it with your all. Unlock your potential and you create memories to hold onto throughout your FFA career and the life ahead.